Sunnyvale, CA—August 29, 2006 – OCZ Technology Group, a worldwide leader in innovative, ultra-high performance and high reliability memory, today announced the exciting unveiling of the PC2-9000 Ti Alpha VX2 DFI Special Edition, an exclusively engineered series of memory optimized for the new DFI LANParty UT NF590 SLI-M2R. 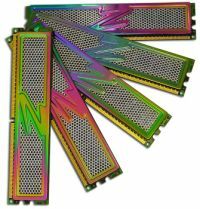 “OCZ is excited to introduce the new Titanium Alpha VX2 DFI Special which was co-developed with enthusiast motherboard partner DFI,” stated Alex Mei, VP of Marketing, OCZ Technology Inc. “Making use of our Voltage eXtreme technology, these new modules once again break the speed record with PC2-9000, and are optimized do deliver the world’s highest speeds on the latest DFI platform. The PC2-9000 Ti Alpha VX2 DFI Special will be available in 1024MB Modules and 2GB (2x1024MB) dual channel kits.